…But it doesn’t end there. On MobiForge a few weeks ago, Ronan Cremin pointed out that most top sites use some form of server-side detection to send different HTML to different devices. In a follow-up article, he takes Google as a specific example to show just how widely its content varies between an iPhone, a BlackBerry Curve, and a Nokia 6300. The height and width of the viewport being used. (Including the device’s portrait/landscape orientation.) 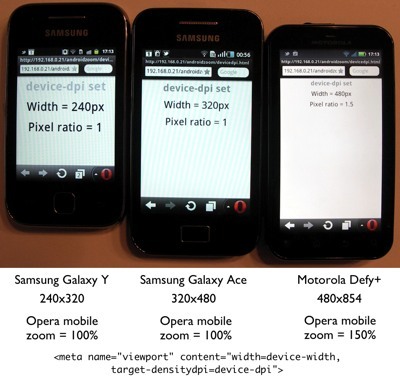 If you detect a mobile device, you will be able to look up the device’s “standard” dimensions in a device database, but the user’s actual viewport may be different. If you place a web app on your iPhone’s home screen, and run it without browser chrome, it will send the same user-agent string as when it is running in a browser with chrome (thus reducing the available height). The user may be viewing your site in a browser panel embedded in a separate app, which may present a different viewport. As Stephanie Rieger explained in “Viewports all the way down…“, anyone can create embed a web view of arbitrary size in a home-made ebook. The zoom level. Lyza Gardner wrote about how zoom levels and different text sizes can mess up pixel-based responsive layouts. A user-agent string contains no information about whether a user has changed the default font size in their browser. It does happen, and probably more often than you think. Basically, just because the user-agent string says “iPhone” doesn’t automatically mean you’re dealing with 320 x 480. Server-side detection alone will not give you the full picture, and only doing adaptation client-side robs you of the opportunity to perform really useful server-side optimizations. The best approach is a blend of the two, as Luke Wroblewski describes in “RESS: Responsive Design + Server Side Components“. I used to use the Flickr Uploadr tool a lot to upload photos to Flickr, but over the last year or so I’ve found myself doing it less and less — even to the point of wondering if I should keep up my Flickr Pro membership. I think this was because I started using iPhoto. I don’t used iPhoto a lot, but adding one more tool to my photo workflow was enough to make the act of working with photos a burden. Go to Flickr to add photos to the map. Maybe add some titles manually. Use iPhoto to organize photos into events, and set the correct rotation. Maybe add some titles manually. Over time, I drifted into the habit of only placing photos into my own archive and importing them into iPhoto, and skipping the steps of uploading to Flickr. Flickr is not a bad tool by any means, but rotating and sorting in iPhoto is much faster and more immediately rewarding. The extra effort of doing all this again for Flickr put me off doing it at all. 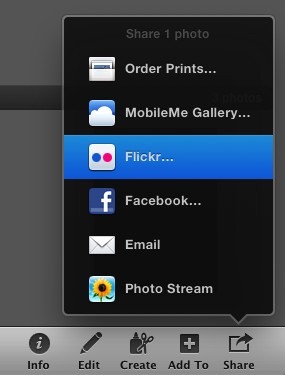 From here, you can add the selected photos to an existing Flickr set or create a new one. You can set the usual privacy options, and you can choose whether to upload a scaled-down image or the full version. This means that I can organize all of my photos in iPhoto, rotate them, name them, add descriptions, set a map location, etc. ; and then push them up to Flickr at the press of a button. No added effort. Awesome. This is a workflow I can live with. Which are the blog entries I will enjoy looking back on most in ten years’ time: the hard-core techie ramblings about irrelevant ancient technical obscurities, or the personal musings that give insight into where my heart was at? 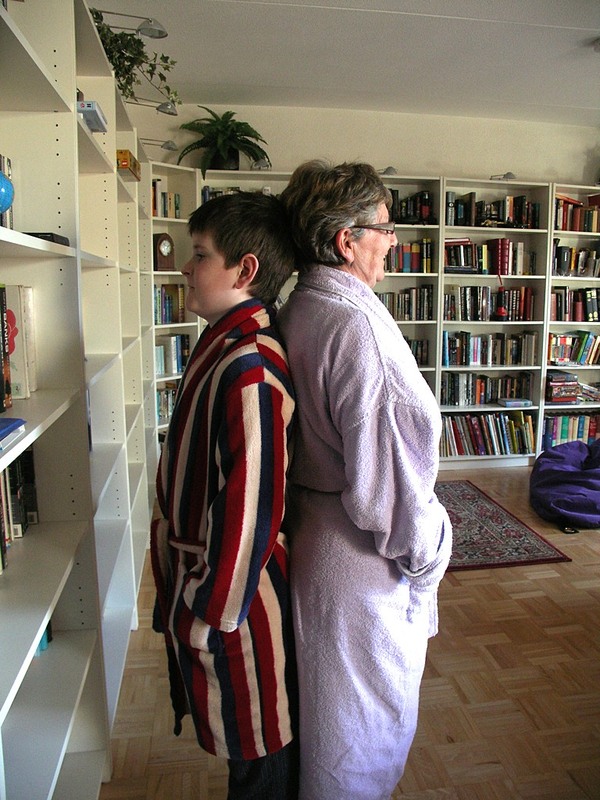 I don’t remember when I got to be as tall as my mum, but Alex is getting pretty close now. This photo is from last week (21 March 2012). Alex will be 11 in just a couple of weeks. If you diff your code and review your changes before you commit to your version control system (you do use a VCS, don’t you? ), it’s often easy enough to spot a debug property, and fix it before you actually check it in. But sometimes the changes are subtle, and they slip through anyway. By outdenting properties, they remain visually obvious in your code even after accidentally pushing them to production. You can do the same by commenting out the original property, of course, but I find the outdenting technique faster to clean up afterwards. If you are building for mobile, you probably don’t want this. You can use the viewport meta tag in the head of your document to tell the browser to render at the actual width of the device. Wait, what? They all show a screen width of 320px? Don’t those three devices all have different screen sizes? Shouldn’t they go 240px, 320px, 480px? 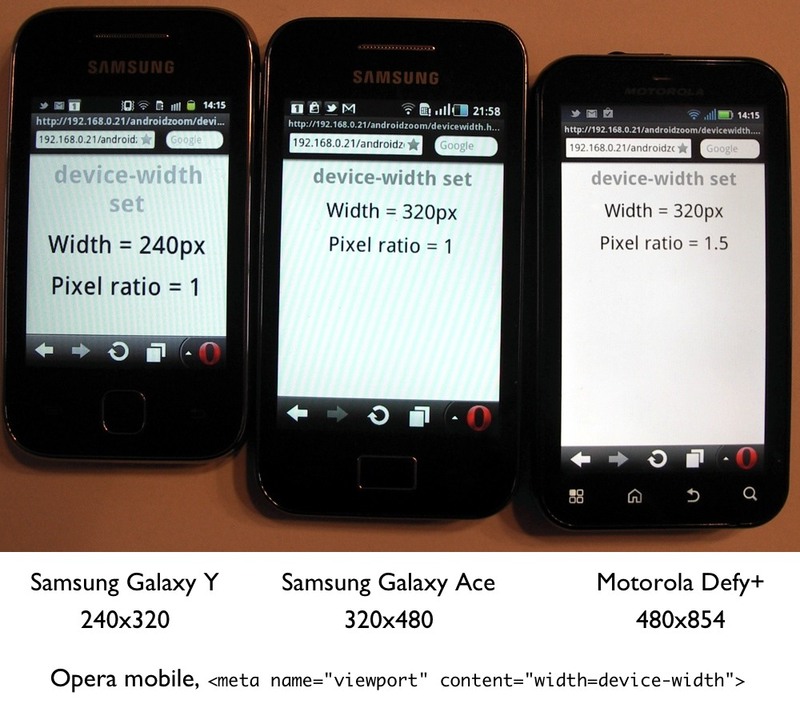 I paid for a high-resolution 480x854px phone, damn it; where are my pixels?! 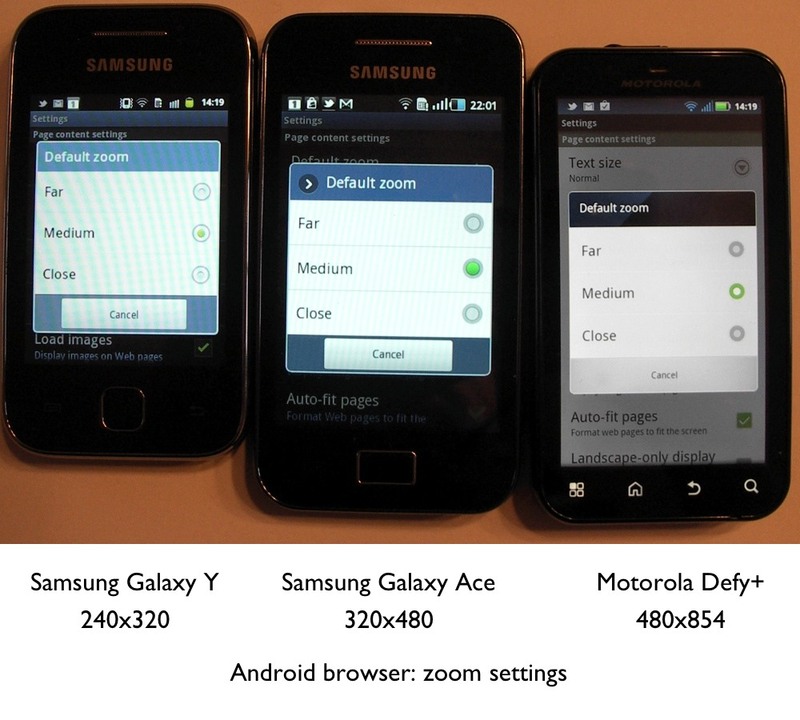 The stock Android browser has a similar setting, found under Menu → More → Settings → Default zoom. In the Android browser your choices are limited to “Close”, “Medium”, and “Far”. 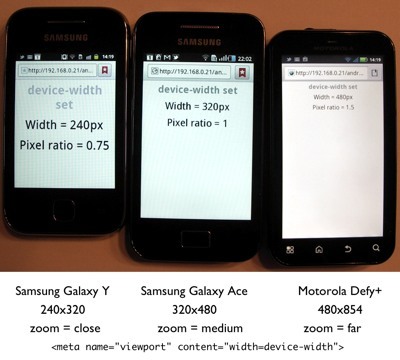 By default, all of the Android browsers had their zoom set to “Medium”. 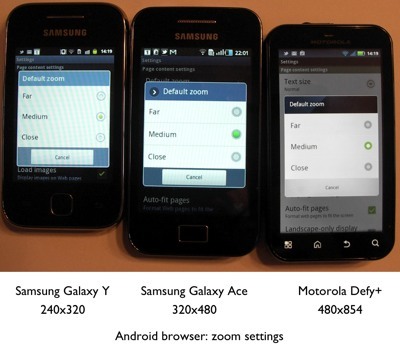 By setting the first device to “Close”, and the third device to “Far”, I can persuade the devices to render at their natural hardware resolution. This doesn’t actually help me as a web developer, though, because I can’t force a user to change their browser settings. Looking back at all these photos, you can see that the test pages show a second value, pixel ratio, which comes from window.devicePixelRatio. This should (I think) tell you how many device pixels go into a CSS pixel. 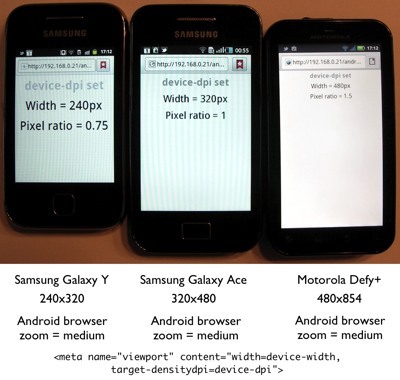 For example, if the screen width is 320px, and window.devicePixelRatio reports 1.5, then the device is actually using 480 hardware pixels to render the 320px-wide layout. This means you’re working with a high-resolution display, so text will be crisper, and you can use high-resolution versions of images. But although this works as expected in Opera Mobile, the Android browser seems to always report the default value for window.devicePixelRatio no matter what the actual value is on the page, as specified either by the user’s zoom setting, or forced by the target-densitydpi=device-dpi property in the viewport meta tag. Android browser on the Defy+ keeps reporting a value of 1.5 even when it is using a 1:1 pixel mapping, and the Galaxy Y keeps reporting 0.75. Likewise, min-device-pixel-ratio media queries are triggered from these default values, not from the active pixel ratios. This might be a problem when it comes to loading different versions of image assets. I don’t recommend using this target-densitydpi viewport setting in real life. It may be tempting to force a 1:1 pixel mapping so that you can deliver wider layouts to high-resolution devices, but a typical 480px-wide layout looks uncomfortably small on a 4.5cm-wide screen. The point of high-resolution screens on mobile devices is to make the content look sharper at the same physical dimensions, not to keep squeezing more and more content into that space. I’m pretty sure that’s why Mobile Safari on iOS does not support this property in the viewport meta tag at all. 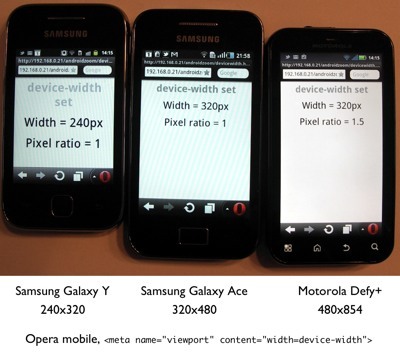 At the other end of the scale, there are plenty of low-resolution devices out there that use a devicePixelRatio of less than 1 to make their small viewports appear wider. The inexpensive Samsung Galaxy Y is a great example. It has a screen width of 240px, but pretends to be 320px wide by rendering 4 CSS pixels are across every 3 hardware pixels. This makes 320px-wide layouts look a bit blurry, but that’s better than breaking; many sites consider 320px as their mobile baseline (hello, iPhone), and ignore smaller viewports. 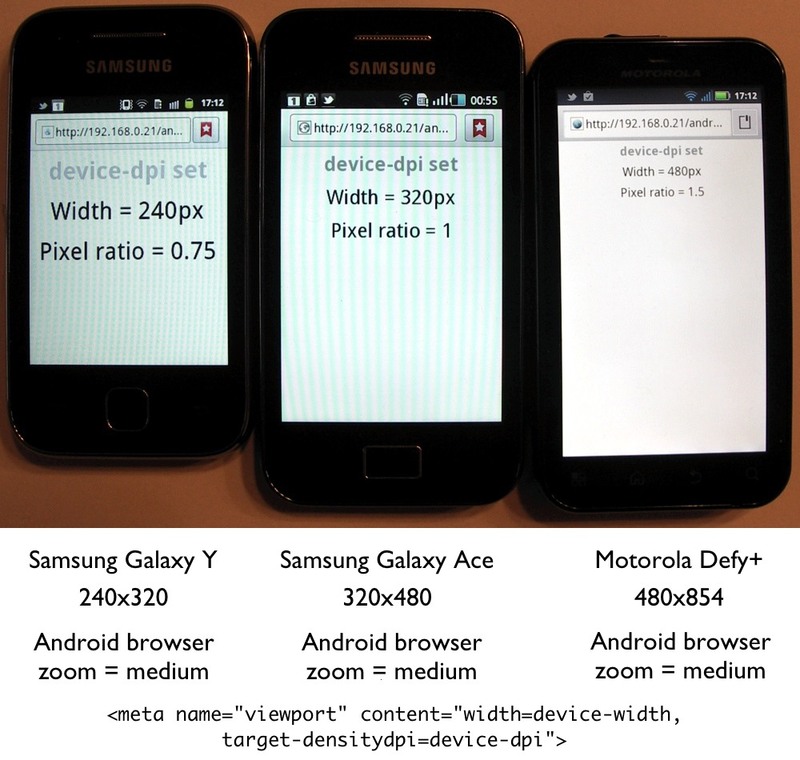 Basically, don’t set target-densitydpi unless you really know what you’re doing, and are prepared to consider the actual physical dimensions of your CSS pixels, which means testing on a lot of devices. Otherwise, trust the mobile browser to render those CSS pixels at a size that is comfortable for most users. If the user wants more control, the browser zoom setting is just a couple of taps away. Site-like, or document-oriented web projects generally align with a 100% compatibility strategy: you want your content to render acceptably and be at least minimally usable on any web browser. Other markets are different, but StatCounter’s mobile figures for Europe in February 2012 show that 73% of mobile browsing comes from iOS and Android devices. 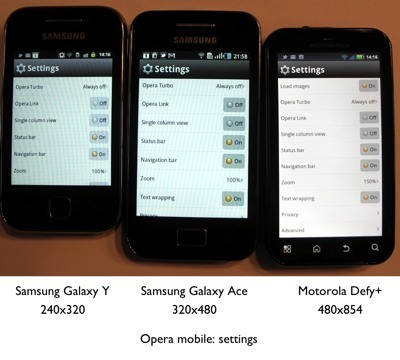 (Some Android and iOS users may be using Opera Mobile or Mini, but that percentage is small.) Throw in a smattering of BlackBerry 6 and 7 devices, some high-end Nokias, and a few Windows Phones, and you could take this to mean that about 80% of mobile web users are working with a touch-screen device running a relatively modern browser. If you go with the partial compatibility strategy, your device library should cover this 80%. Testing a feature-heavy site on BlackBerry 5 or Nokia S60 browser is going to drive you mad, and isn’t going to serve your core customer base. Because you’re concentrating on the medium-to-high end of the market you’ll spend more money per device, but you can get away with relatively few of them. I’d suggest a handful of Android and iOS devices, a BlackBerry 7, and a Windows Phone Mango. Make sure that the devices you get cover a variety of screen resolutions (small smartphone, large smartphone, tablet). If you’re aiming for 100% compatibility, you need to focus your attention on the other 20%, because that’s where you’re going to spending the vast majority of your time debugging and fixing crazy bugs. Buy as many cheap, old, low-spec, oddball devices as you can lay your hands on. Any time someone says “WTF – you’re browsing the web on that thing?” award yourself special bonus points. Low-spec is good because if your site works well on a slow device, it’s only going to do better on a faster one. Because the 20% represents the long tail, you will need more devices, but they will be cheaper ones, so you’ll probably end up spending just the same amount of money. Building a device library is not a one-off thing. It’s not like a developer workstation that you can get away with upgrading every 2-3 years. New devices and new OS upgrades are being delivered at a rapid pace. If you can afford it, you should be looking to add new devices to your library at least every six months. Again, if you can afford it, don’t upgrade the OS on old devices. Over time, they will become your legacy devices. Nokia N95. 240×320 screen, S60 browser. The first phone I used for doing mobile web work. Released in 2007; an impressive piece of kit at the time. Unfortunately it has lost the ability to connect to my wifi, so testing with it is a bit of a pain now. Nokia C3-00. 320×240, keyboard, no touch screen. Uses the Nokia Ovi browser by default, but also has Opera Mini built in. Cute little phone. Nokia C5-03. 360×640 resistive touch screen with haptic feedback – it buzzes when you press the screen hard enough for it to register a touch/tap. The screen is small, but high resolution, and looks great. I used to think that it was a bit crap for web use because it only had a numeric keypad, but that was before I figured out that the qwerty keypad only shows up when you hold the phone in landscape mode on its left side, not on its right. Way to go, Nokia. Also, the “Create WLAN connection in offline mode” prompt should have died 5 years ago. Motorola FlipOut. Android 2.1, 320×240 touch screen, and a keyboard. The keyboard doesn’t slide out, it rotates out from behind a corner. When it’s closed, this looks more like a pager than a phone. It’s cute and small, and I really like it. Samsung Galaxy Ace. Android 2.2, 320×480 touch screen. Relatively cheap and versatile, because it can be upgraded to run 2.3 as well. (Buy two while they’re still selling them with 2.2!). 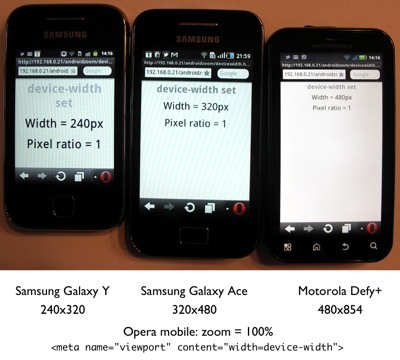 Samsung Galaxy Y. Android 2.3, 240×320 touch screen that pretends it’s 320×480. Cheap. Nice-looking little phone, but the touch screen is dreadfully inaccurate. iPhone 3G. iOS 4.2, 320×480. The first iPhone in our household; I inherited it from Abi when she upgraded to a 4 in 2010. Useful as a legacy iOS4 device. iPod touch 4th generation. iOS 4.3, 320×480 (retina). Gorgeous little device. This is my stand-in for an iPhone 4, because it has the same A4 chip and retina display resolution (although the screen is slightly lower-quality than the actual iPhone 4). I’m currently trying to figure out if I want to upgrade it to iOS5 to match the distribution of hardware in the wild, or keep it on iOS4 as a legacy device. It’s a cost consideration. iPad (original). iOS 5, 1024×768. Still great. BlackBerry Curve 8900. BlackBerry OS 5, 480×360 screen, keyboard. BlackBerry 5 is the OS That Will Not Die. BB5 devices are still being sold in volume because they’re cheap, have great keyboards, and people like using them for texting and messaging. LG Optimus 7. Windows Phone 7 Mango, 480×800 touch screen. This was my first Windows Phone, but I don’t think it’ll be my last. I like WP7 as an OS. I like the sleek design, and the live tiles on the home screen. As a phone, the Optimus 7 is just okay. It’s big, heavy, the screen brightness is harsh, and the camera is only so-so. But I still found myself carrying it around a lot as my day-to-day phone. Nintendo 3DS. This is what I mean by “oddball”. It has two screens, one on top of the other. 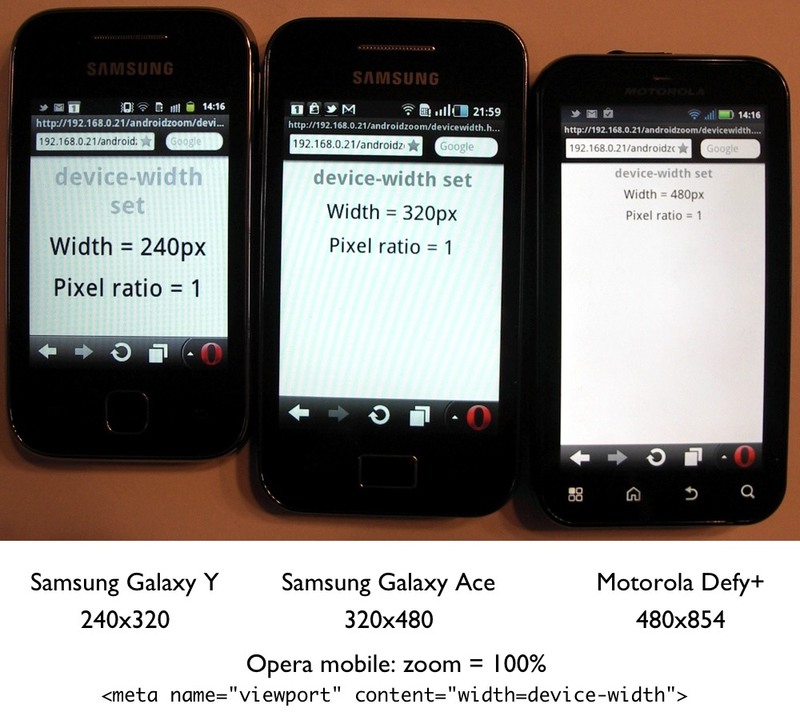 The top screen has an effective resolution of 400×240 (landscape) and the bottom one is 320×240 (landscape). When you load up a page, the page loads into the bottom screen, but you can scroll it upwards. Only half the page is touch-capable (the bottom screen). The browser is a custom webkit build, made by Netfront. It scores 125 on html5test.com. It’s cheaper than most of the other devices in my library, and it plays Zelda? Come on, how can you not love this? The big disappointment is that you can’t embed 3d images in a web page. The top screen has to switch into a separate 3d-mode to show 3d images and video. The new iPad with retina display. These are going to sell by the ton, and people will be using them to browse the web all the time. Apart from wanting one for myself, I can easily see the new iPad on its own accounting for more than 10% of all mobile browsing by the end of the year. 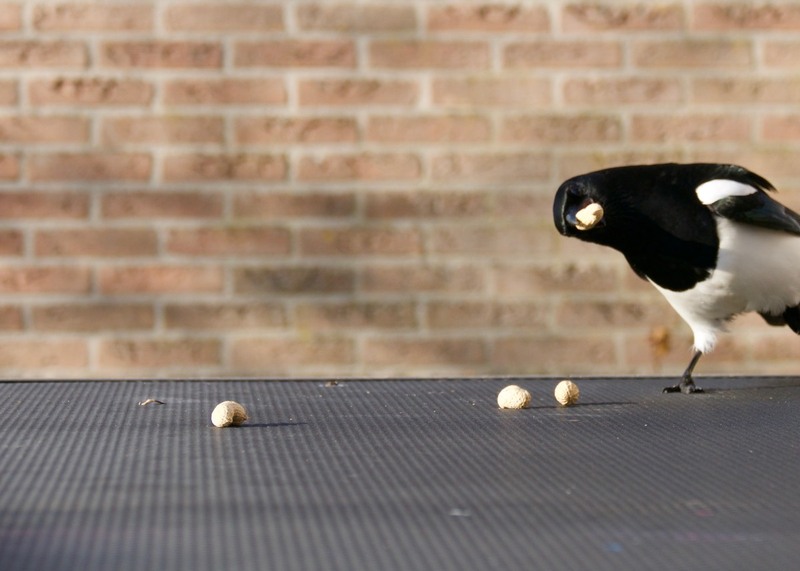 23 March 2012: target acquired. This thing is awesome. A BlackBerry 7. A touchscreen-only or keyboard-only device would be cheaper; a touch+keyboard device would cover both categories, but it much more expensive. Also, not a huge market share. Not sure about this. An Android 4. There aren’t enough Android 4 devices on the market yet to give it a significant amount of market share, and therefore to worry about it as a target for testing with. I’m trusting that it’s going to be mostly like Android 3.x, but faster. I might check out the Samsung Galaxy Tab 2 7″ when it appears. Otherwise, I’ll just wait for cheaper devices. “iOS Ebb and Flow” by Chris Suave (iOS platform statistics).